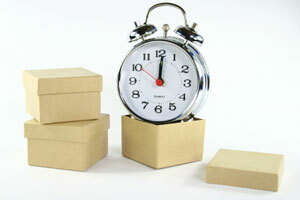 Putting it simply, time boxing is the most effective time management tool that I know of. Even if you already know and use it to some extent, there is a good chance that you can make it even better with some of the tips that follow. For those new to it, time boxing is simply fixing a time period to work on a task or group of tasks. Instead of working on a task until it’s done, you commit to work on it for a specific amount of time instead. But don’t let the simplicity of the concept deceive you — there’s much more to this tool than meets the eye. The most obvious use of a time box is to make progress on big tasks. On the one hand, it enables you to continuously make progress on these intimidating tasks. On the other hand, it makes sure working on these tasks won’t overrun the rest of your day. Time boxes are a great way to tackle those annoying, tiny tasks that keep bugging you (pun intended). The problem with these pesky little tasks is that each of them, alone, may be regarded as insignificant enough to be postponed. After a while, however, there are enough of them to drain a significant amount of your mental energy. A good strategy to claim back that energy is to create a time box and tackle all of them at one sitting. If you’re procrastinating on a task, forget about completing it: just put it in a time box instead. You overcome your resistance towards the task and chances are that when the time is up you’ll have built enough momentum to continue working on it much longer. That’s right, if procrastination is your problem, feel free to ignore the timer when it buzzes. That’s what I call an ‘open time box’: you set a minimum period of work, which you may extend as you like. For such type of time boxes, I like to configure my timer with a round of applause sound as a little incentive to keep me going. Perfectionism is the flip side of procrastination. Instead of avoiding a task, you dwell on it for so long that when you notice, all your time is gone. To avoid perfectionism and the effects of diminishing returns, having a definite cut-off time for a task is one of the best strategies you can use. Dealing with perfectionism demands what I call a ‘closed time box’: setting a maximum period of work. When dealing with these time boxes, I like to configure my timer with a disruptive, annoying buzz sound to remind me drop the task immediately. Time boxing a particular task helps excluding other tasks and unrelated thoughts from your radar during that particular time window. Reducing mental clutter is essential if you want to be fully productive. Also, by organizing your work in time boxes you have the structure you need to properly prepare for your tasks. By taking care of potential distractions beforehand you maximize your chances of getting fully in flow. Isn’t it true that you get much more accomplished in one of those pre-vacation Fridays than on any other normal workday? For some reason, it seems that our most efficient work is usually done at the end of a time period when there’s a very well-defined cut-off point. Time boxes give you just enough of this healthy time pressure, enabling you to take full advantage of this ‘end effect’, so make sure that timer is visible and you can see the time going by as you work on your task. Big tasks, no matter how important, can be demotivating: you simply need to work for too long to see their outcomes. We may prefer deferring important tasks so we plow through many quick and easy tasks, just for the sake of the false perception of accomplishment. But just like the simple act of crossing off items from your to-do list can be motivating, so is successfully completing a time box. Completing a time box works as a visible sign of progress. Another idea on how to use time boxes to boost motivation is to make a game or challenge out of them: How many prospects can you call during one hour? Why not trying to beat your own record? Although some people may want to stone me for this, I don’t agree that we should have SMART goals for everything (SMART meaning ‘specific, measurable, actionable, realistic and timely’). Sometimes I enjoy the freedom of an open outcome. Sometimes I just want to improve something — no specific, precise goal in mind. This has been especially the case since I started experimenting with smaller, gradual goals). I think it’s healthy not being 100% objective all the time. That said, you can’t afford these “relaxed goals” to overrun your daily plan — you know, when you actually need to be fully focused on things such as deadlines and SMART goals. Corner your fuzzy goals with a time box and get the best of both worlds. Projects that require a high amount of creativity are not best tackled start-to-finish. The most effective way to deal with a project like this is to have an initial phase of immersion — a period when you generate a burst of ideas — and then forget about them for a while. By letting it go, you give time for the subconscious mind to work on the problem. This initial brainstorming phase is a perfect candidate for time boxing since there’s usually no precise outcome for it. (Unless you define a precise outcome for the creative process, such as in a List of 100 or Idea Quota). How many times have you wondered at the end of the day where did all your time go? As reader Iain Hamp suggested in a comment, performing time audits is an extremely valuable activity to diagnose your time, as well as aligning your time and values. Structuring your day in time boxes makes these audits super-easy to do. Also, being more aware of how much you can really fit in your time is liberating, as it helps you saying ‘no’ to unimportant things more often. You only get maximum effectiveness if you properly balance periods of work and rest. Time boxes provide a great framework to allow this balance to happen. The key is to find your own rhythm. Alternating between different types of time boxes (such as work/rest, or hard/easy tasks) maximizes your use of energy and enables you to accomplish much more. My favorite work rhythm is alternating between blocks of 50 minutes of work and 10 minutes of rest. For quick sprints, Merlin Mann’s remarkably effective (10+2)*5 hack is also a great option. If you’re interested in a more in-depth discussion about different patterns of time bursts, I recommend Mark Forster’s book Get Everything Done and Still Have Time to Play. Working on your most important projects first thing in the morning is a classic tip to guarantee that you do meaningful work in your day. Create a time box to work on your dreams every day — before the world out there has a chance to disrupt your plans. If you don’t plan to use time boxes for anything else, please consider applying just this one tip. This is perhaps the single, most effective thing you can do in pursuit of your dreams. It’s common to become too focused on a specific area of our lives at the expense of others. Remember, you don’t need to use time boxing only for work-related tasks: you can block time for anything that matters to you: leisure, family, hobbies — anything. Pre-allocating time boxes for the things that matter most is an excellent strategy to help you live a balanced life. In fact, planned time boxes are at the heart of the prioritization system I use. I plan to explore it more deeply in a new article. Stop kicking yourself; all you need to do is to put a time box around them to reclaim the time back. If you tie your rewards to the completion of tasks, you may find yourself doing only quick and easy tasks, and avoiding the important ones. Why not get yourself a little reward after you complete a time box instead? A personal example: Checking e-mail multiple times a day is an old addiction I haven’t yet managed to cure. While the ideal solution would be to the task of checking for e-mail in a time box, I now use it as a reward for completing time boxes — an extra incentive that works wonders! Rewards can be as tiny as a glass of water or a deep breath at the window (for more about tiny rewards and their powerful effect, I recommend the chapter ‘Bestow Small Rewards’ in One Small Step Can Change Your Life — check the full book summary). If you are not using time boxing yet, please give it a try. If you don’t have a timer, I can recommend a few: Since I spend most of my day at the computer, I primarily use the tiny and super-functional application on my desktop Egg and Timekeeper on my PDA when I’m away from the computer. For a free, cross-platform, browser-based solution, you can use Virtual StopWatch. You can also of course use regular kitchen timers — I’ve seen the Ultrak T-2 model being recommended somewhere. And what about you folks who already use time boxing? What’s your experience with it? Do you have any other specific uses? Do you have any specific timers to recommend? Are you as excited about time boxing as I am? Please share your thoughts in the comments!